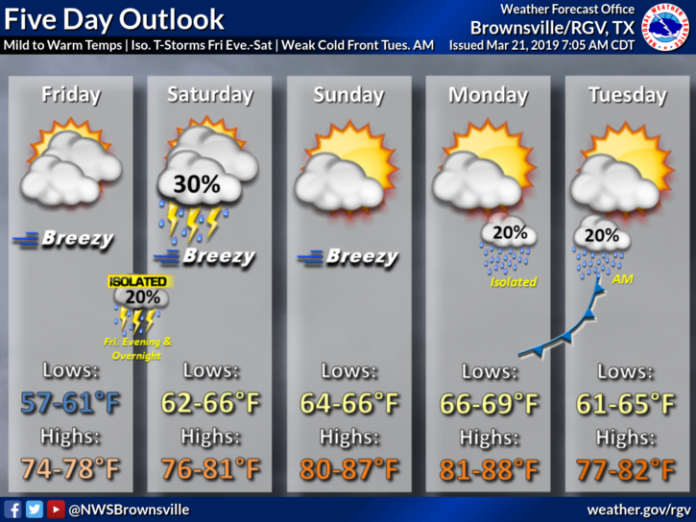 Warmer and drier conditions are expected Thursday in the Rio Grande Valley, according to National Weather Service in Brownsville. Highs will be in the upper 60s along the coast and mid 70s inland. Expect partly to mostly sunny skies by the afternoon. McAllen is expected to be 76 degrees, Harlingen 75 and Brownsville 74. Looking ahead, the warming trend will continue through the weekend and into early next week, with highs in the 80s by Sunday. Friday highs will be between 74 and 78 with a 20 percent chance of thunderstorms overnight into Saturday. On Saturday, there is a 30 percent chance of thunderstorms. Highs will range between 76 and 81. Expect breezy conditions this weekend.